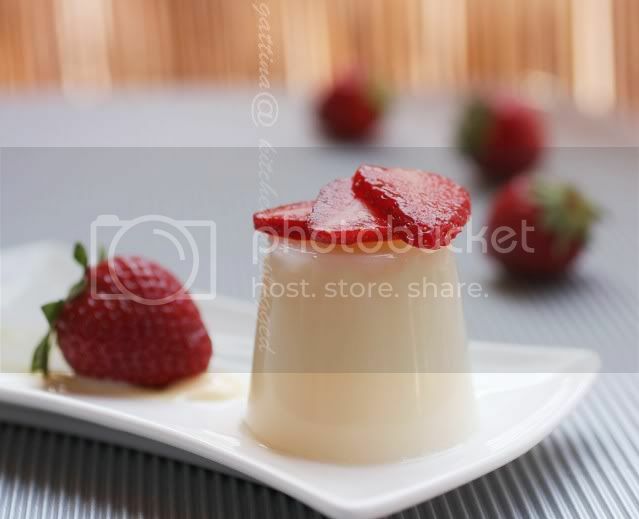 Almond Milk Pudding, garnish with strawberries. The milk is from the first pressing, enriched with flavor and all-white color. If you don't know what agar-agar is, think of gelatin but in a vegan-friendly form. Some gelatin can contain slaughter by-products but agar-agar is derived from seaweed. This pudding is made out of dairy-free almond milk (home-made), thickened by agar-agar. I remember agar-agar dessert was very, very popular in Singapore (and also its neighbor countries), not sure if it relates to the significant portion of population who don't consume a certain kind of animal meat. Anyway, they made amazing agar-agar desserts. Just for this already worth my staying. We use gelatin and agar-agar the same way. Which is better? For me, I'm totally on agar-agar! Agar-agar jelly is slightly firmer and gummier, it definitely gives out a better "mouth-feel". Besides using with the traditional fruit juice like pineapple or orange, it goes particularly well with coconut milk. It doesn't limit itself in sweet treat, agar-agar strips are commonly added into (savory) salad because people simply enjoy the chrunchy texture. On the next day, pour the almond mixture through a tea towel to another container. Sneeze the towel very tight and try to sneeze out all the milk. Mix it with sugar and bring it to boil. Taste. In a small pot, whisk the almond milk and agar to combine, bring them to boil until the agar dissolves. Pour the mixture into containers, after they cool off, chill in the fridge until they set, that may take 1 or 2 hours. 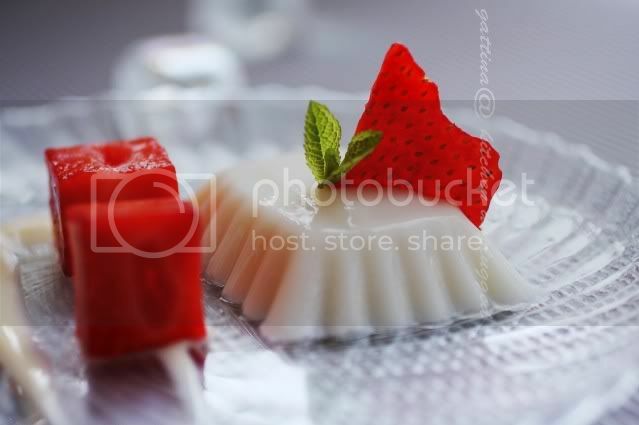 Beautiful and delicous, i have sen agar agar in asian shops, but never bought them, next time i am going to buy agar agar and make this yummy dessert. I made something similar with Almond but in the Microwave, called Rabri in India. Wow... it looks incredible! Nice photoes! Wow, What a beauty. I have almonds and I have gelatin. Gelatin should work? Wow!! I was just thinking of making coconut milk pudding when I saw your almond milk pudding. Will give it a try soon. lovely clicks..yummy dessert..i will give a try!! Thank you for such good Information, Really appreciate the work done by you.....If you are out for genuine recepie tips ......Please Check out the blog mentioned below its really cooool !!!!!!! Also there is an amazing Tea game.... Check it out, I'm Sure you'll love it. I love the almond gelatin at Chinese restaurants, I've only made it with gelatin never with agar agar or from real almonds. this is so beautiful with the berries. Have fun making gorgeous berry desserts! Ooooooooooohhhhh.....Gattina!! This dessert looks so lovely ! This is pure deliciousness!! Gorgeous presentation! Always a pleasure to follow up on your culinary adventures. And your dessert is so pretty! I've never used Agar-agar, but now I'm really curious about it. One more thing in my list of things to try. That list is getting really long. Those colors are truly stunning, Gattina. I love puddings so much; I know I'll have to try this one. Oh, wow, the pudding looks so delicious, and I love almond milk! I have made mine before (so easy!) but right now I have some store bought one, have you made it using that? It should work too, right? I will make it this weekend, can't wait!! wow my mouth is watering reading your blog. Some wonderful stuff here. This is one of my favourite pudding. But I can never be like you that patient for freshly squeezed almond milk. fantastic! this brings back memories of my indonesian grandma and her classic fruity agar-agar desserts. Can't wait until strawberry season so that I can try this.